Definition at line 92 of file CMiaseBase.h. Definition at line 111 of file CMiaseBase.cpp. Definition at line 114 of file CMiaseBase.cpp. Definition at line 117 of file CMiaseBase.cpp. 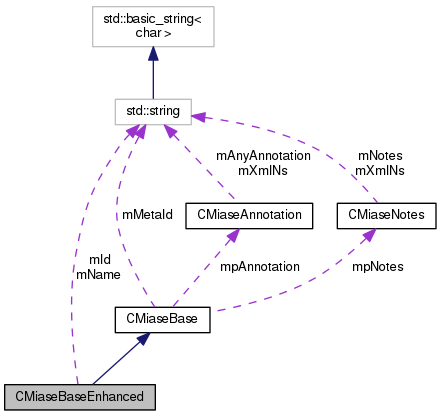 Referenced by CMiaseSed::getModel(), CMiaseSed::getOutput(), CMiaseSed::getSimulation(), CMiaseSed::getTask(), and CMiaseParser::testDataStructure(). Definition at line 122 of file CMiaseBase.cpp. Definition at line 127 of file CMiaseBase.cpp. Referenced by CMiaseParser::newModel(), CMiaseParser::newOutput(), and CMiaseParser::newTask(). Definition at line 132 of file CMiaseBase.cpp. Definition at line 109 of file CMiaseBase.h. Definition at line 110 of file CMiaseBase.h.